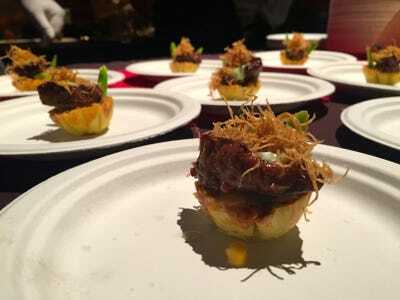 Getty Images for New York MagazineRedFarm’s filet mignon tart was just one of the highlights. 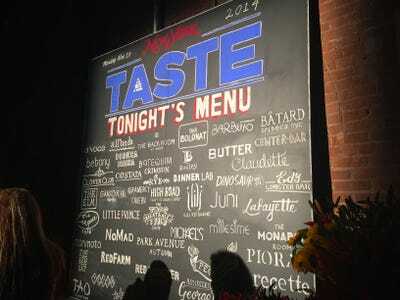 New York Magazine held their 16th annual New York Taste event Monday night featuring more than 40 of the city’s most celebrated chefs and mixologists. 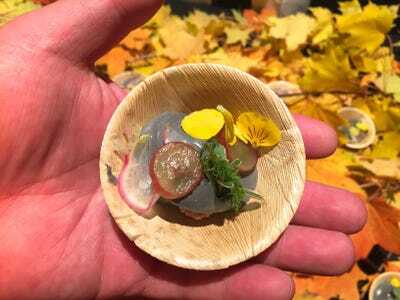 More than 1,000 guests attended the sold-out event to eat bites from New York City favourites like Red Farm, Dinosaur BBQ, Bar Bolonat, Morimoto, Barbuto, and many more. 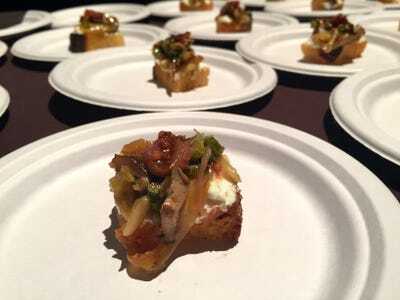 Top chefs dished out briskets, beers, seafood, stews, and intricate desserts. 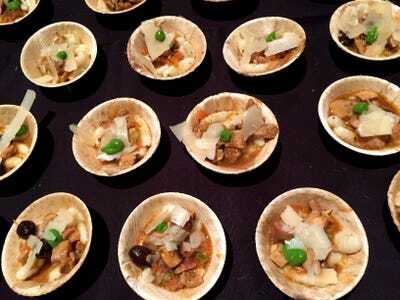 A portion of the proceeds from the evening were donated to City Harvest to help fight hunger. 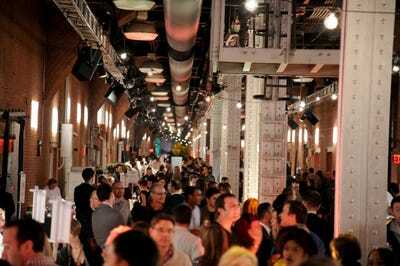 Here's a list of the many restaurants and food brands that participated. 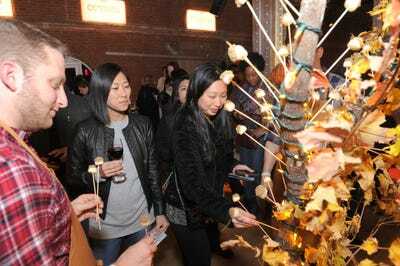 At $100-a-pop for a ticket, more than 1,000 guests attended the sold-out event. 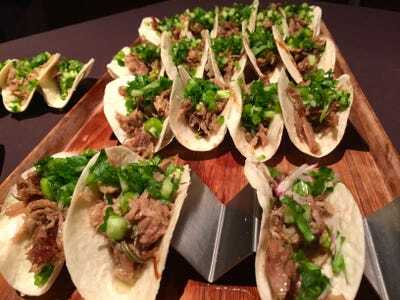 But it was well worth it, with generous portions like these duck confit tacos with hoisin, cilantro, scallions, and jalapeños from Michael's restaurant. 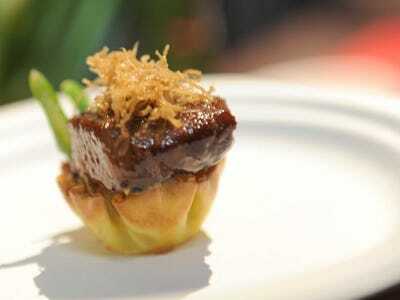 This filet mignon tart from RedFarm was a favourite. 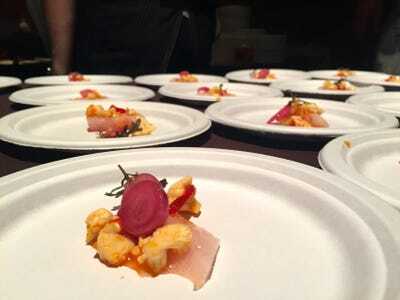 As was Costata's amberjack crudo with pickled cauliflower and chiles, which packed a lot of flavour into a small bite. Juni restaurant's ash goat cheese smothered the bite of chicken below it, and it tasted delicious. 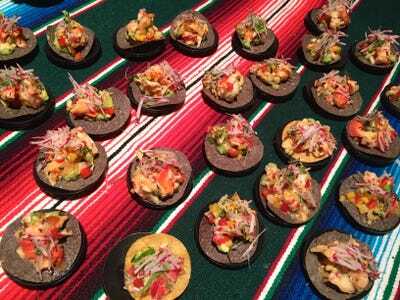 Bodegra Negra offered a colourful lobster tostada with mango cucumber salsa and avocado. Ed's Lobster Bar surprisingly went with lobster meatballs. 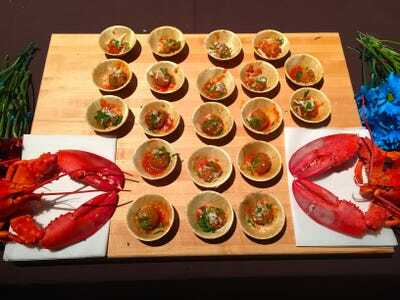 We would have preferred a lobster roll. 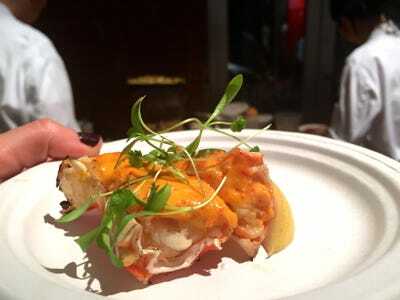 Morimoto's spicy king crab with tobanjan aioli and cilantro was a hit of the night. This ricotta crostini with shiitake mushrooms, fennel, and grapes from Butter tasted better than it looks. 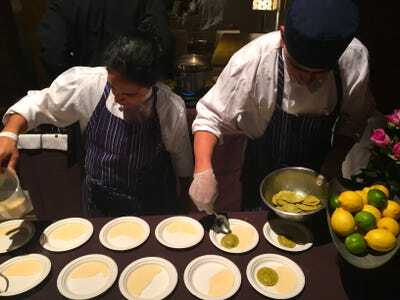 Bar Bolonat had a team of two working on their smoked eggplant ravioli in feta cheese sauce. 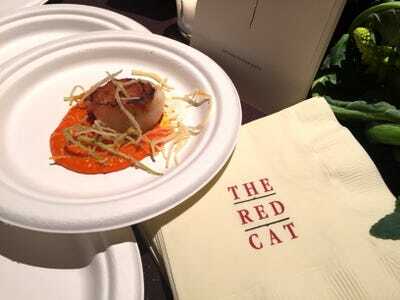 Chelsea's The Red Cat went with potato wrapped scallops in romesco sauce. 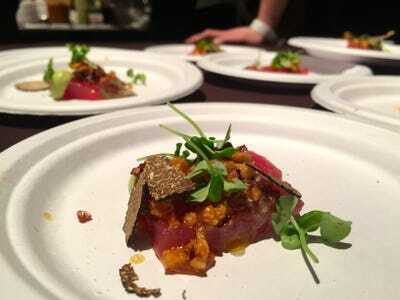 Toloache served up a tasty tuna with quinoa, avocado aioli, and chile oil. 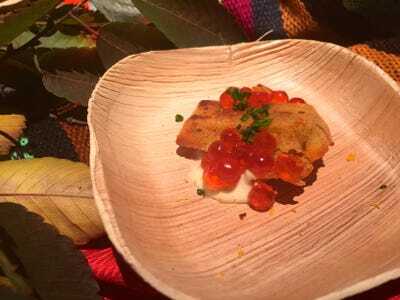 Celebrity chef Marcus Samuelsson's Red Rooster restaurant did a take on chicken and waffles they called 'Birdie Cakes,' made of salmon roe and jerk crème fraîche. It wasn't our favourite. 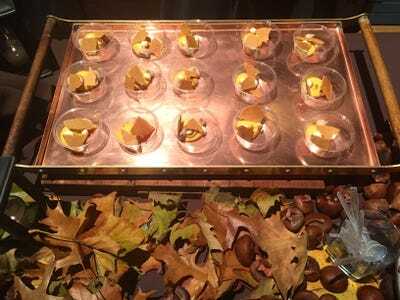 Lafayette restaurant went romantic with their dessert set up of pecan pie and pumpkin spice cream puffs. 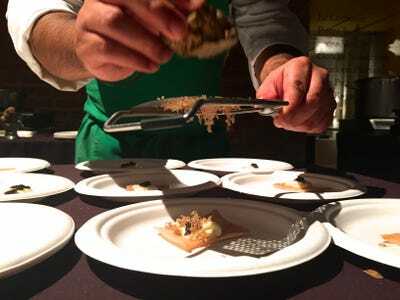 Claudette served a truffled hummus on flatbread with fresh chives. 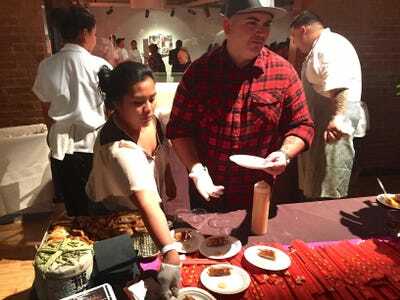 'Top Chef' star Dale Talde's restaurant served pretzel pork and chive dumplings with a spicy mustard sauce. 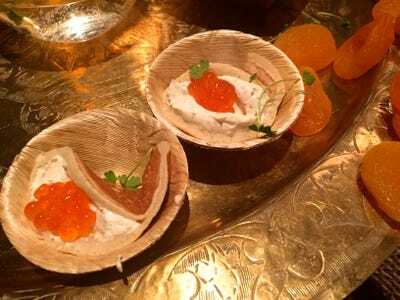 These fennel labne atayef's with salmon roe from Ilili were delicious. 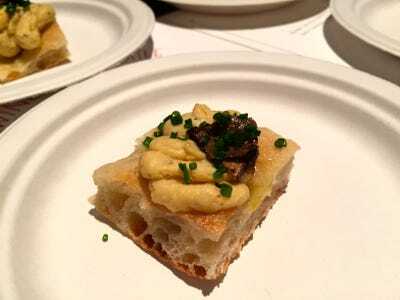 This kuzu chip with black truffle pâté was equally as decadent. 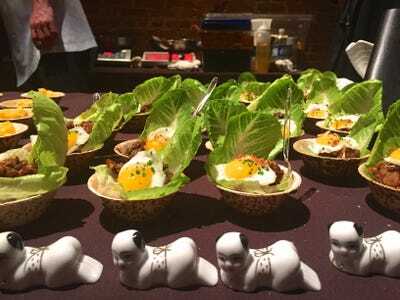 There were mini chicken lettuce cups from Tao. 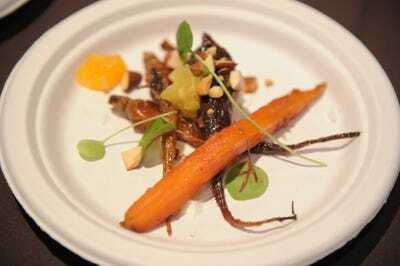 And pretty roasted carrots with honey, yogurt, and almonds from Soho's Little Prince. 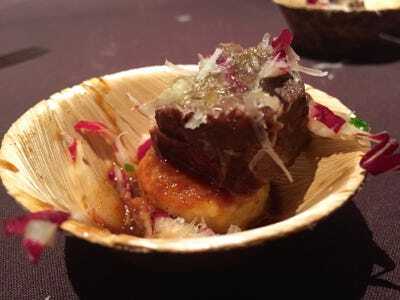 A Voce's braised beef with fried polenta and radicchio. 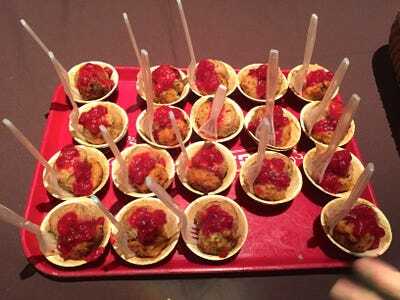 The Meatball Shop showed they are ready for Thanksgiving with these turkey meatballs with gravy and cranberry sauce. 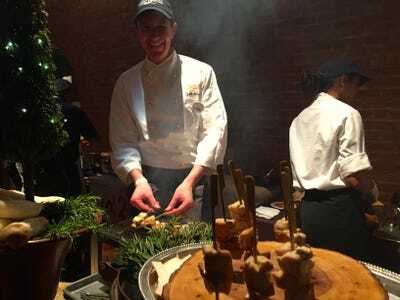 Chefs from Rotisserie Georgette cooked chicken skewers on the spot. Tessa served a rabbit cavatelli pasta. 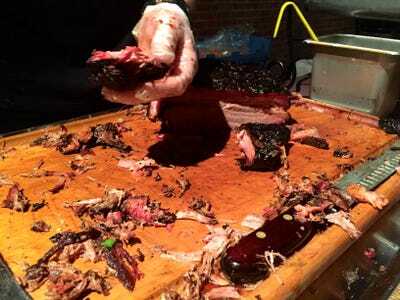 Dinosaur BBQ is always a highlight of the event. 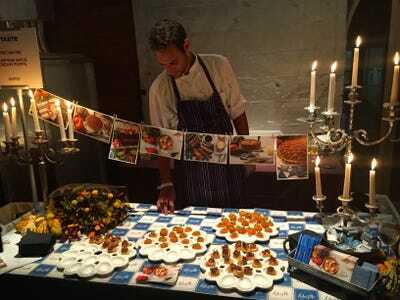 They served mini beef brisket sliders on sweet rolls. 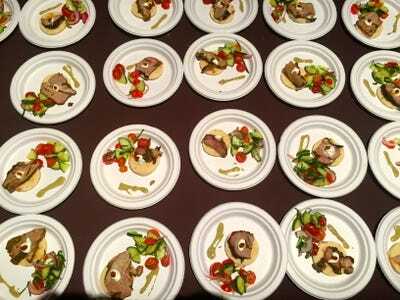 Center Bar did a lamb shawarma pita with tomato, cucumber, and onion salad. Nomad went with an interesting sweet potato custard. 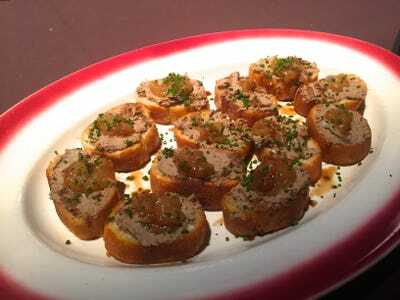 And Barbuto, famous for their chicken and pastas, served a duck liver pâté crostini with apples and saba. For dessert, there were mini caramel apples displayed creatively on a tree. Perhaps most interesting of all was this dinner/dessert hybrid from High Road Craft Ice Cream called a 'South Shore Sundae.' 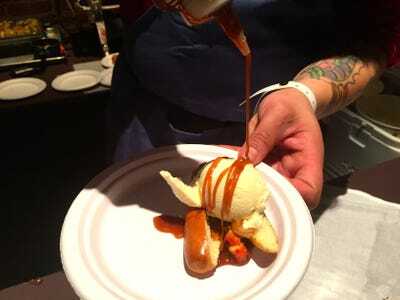 It is a sweet roll filled with caramelized lobster and candied potatoes, topped with sweet corn ice cream. We were too full to try it. 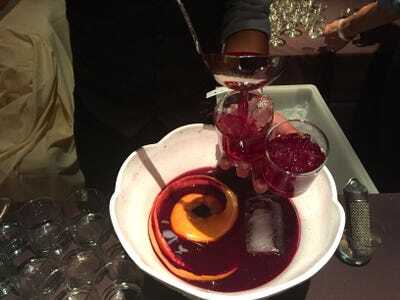 And of course, there were drinks. Grey Goose set up an entire station. 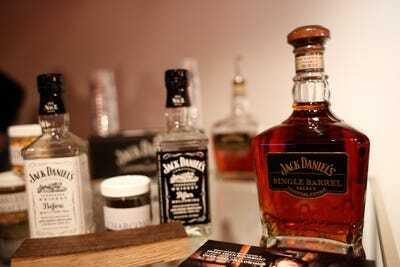 Jack Daniels was proudly displayed throughout the VIP Lounge. 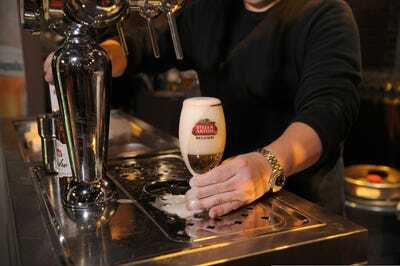 And there was Stella Artois on tap at the open bar. But my favourite was a 'Harvest Lady' cinnamon-tasting cocktail from Clover Club.